It’s no secret that I have a thing for tahini and chocolate. But, when I combined the two in my Tahini Stuffed Dates (aka Tahini Bombs), I lost my mind over the flavor combination. Think savory, sweet, chocolaty, and nutty. It’s a real-life flavor love affair. Not only is this recipe delicious, it’s also SO easy to make, requiring just 5-10 minutes, 1 bowl, and 4 ingredients to make! Enjoy this recipe as a healthier dessert or snack! Add some cacao nibs or magic shell for a crunchy topping. If you aren’t into tahini, try another nut/seed butter like almond butter or sunbutter! And, for a drinkable version, add non-dairy milk to make a shake like this Peanut Butter Banana Chocolate Shake! For even more healthy desserts, check out our V/GF Black Bean Brownies, 5-Minute Espresso Walnut Brownies, Chocolate Chocolate Chip Muffins, 5 Ingredient V/GF Cookies, and Tahini Stuffed Dates! If you try this recipe, let us know! Leave a comment, rate it, and tag a photo #minimalistbaker on Instagram. We’d love to see what you come up with. Cheers, friends! Add tahini (or other nut/seed butter), cacao powder, and maple syrup and blend to combine. 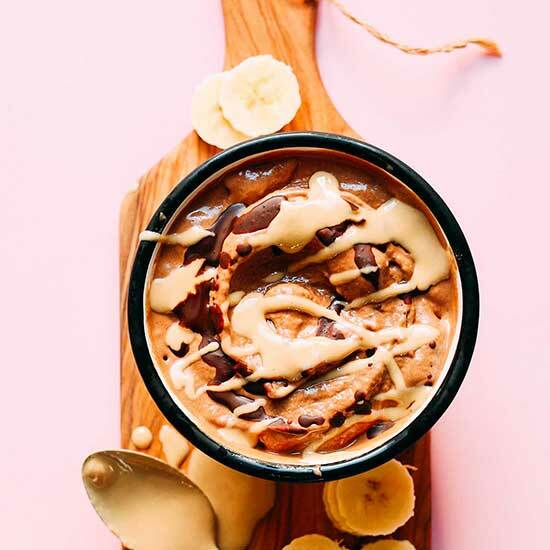 Then taste and adjust flavors as needed, adding more tahini for nuttiness, cacao for intense chocolate flavor, or maple syrup (or pitted dates) for sweetness. At this time, you can also add vanilla extract or a pinch of sea salt for more flavor. Mix as needed to combine. 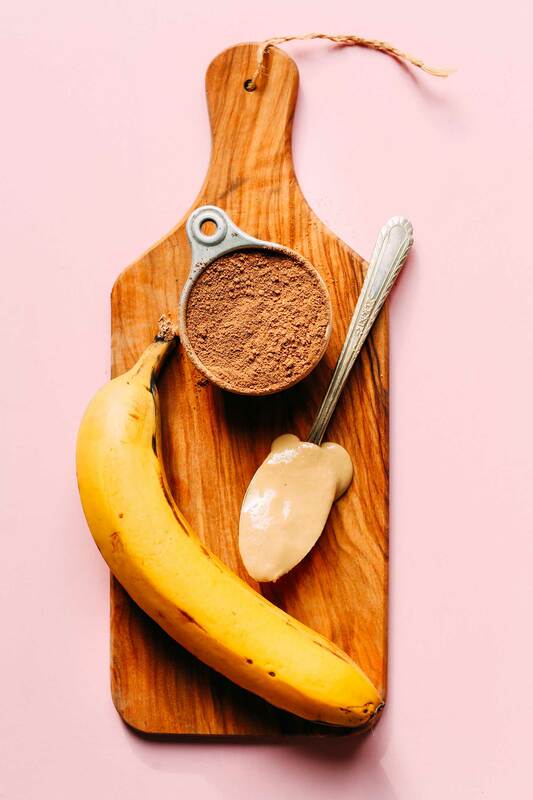 *For a refined-sugar-free magic shell, mix 1 part melted coconut oil with 1 part cacao or cocoa powder and sweeten to taste with maple syrup or other sweetener of choice. Add sea salt or vanilla (optional) to taste. *Prep time does not include freezing bananas. *Nutrition information is a rough estimate calculated with lesser amount of maple syrup and no additional toppings (tahini or magic shell). This was delicious – so creamy and chocolatey!!! I was out of tahini so I used SunButter instead. I also left out the maple syrup and I found it sweet enough with just the banana. Can’t wait to make this again! literally my favorite breakfast(it tastes like a dreamy desert, but healthy!) in a long time and i was still thinking about it after. and im actually craving it at the moment. this is a must try for anybody. i added spinach for greens and you couldn’t even taste it and i also added some flaxseed meal for fiber and almond milk because it wouldn’t blend without, it needed some thinner. i also skipped the sweetener because i found it unnecessary. i made a similar magic sheep like the healthier one you recommend but i just did cacao powder and a little coconut oil, personally i think the bitterness of the chocolate goes great with the sweetness of the banana in the base perfectly. i also stirred in some flaxseed meal to the tahini for drizzling for extra fiber and it gives it a dreamy texture, and more volume! i popped it in the freezer after the shell to thicken the soft serve a little and solidify the shell. i recommend all the changes i made highly. i’m surprised if you actually made it this far, i kinda got carried away lmao, but it’s so amazing like there aren’t enough words to describe it! Very delicious. I did need to add a little nutmilk to get things moving as I used a blender. And no added sweetener just 2 dates. Thanks! OMG. Yummo. I popped it into my icecream machine to make it firmer. So good. Thanks for the recipe. Great! Thanks for sharing, Judy! So so excited to discover a creamy ice cream recipe that I don’t have to modify for my daughter who has food sensitivities to over 50 foods (incl. nuts and coconut)! Also, the recipe sounds so yummy! We’ve always loved ‘banana ice cream’ even before we discovered her food issues. However, it can get icy. 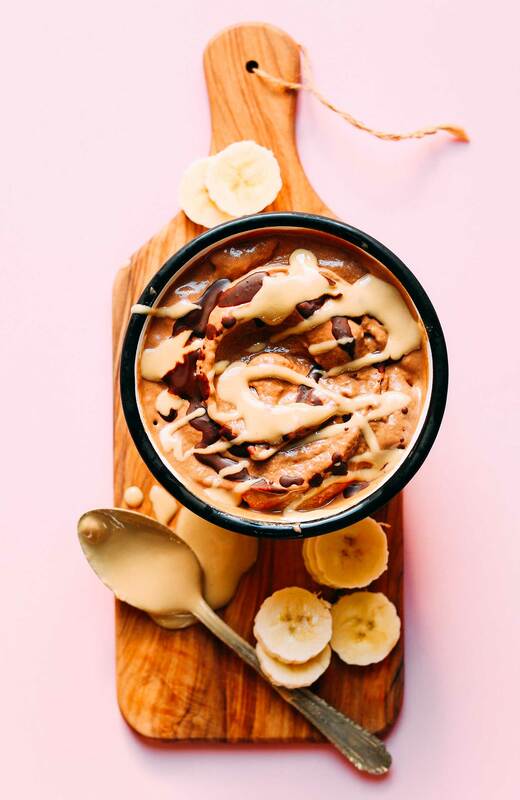 The addition of tahini sounds like it will be the perfect ingredient to eliminate the ‘icy’ factor that we get when we refreeze the banana ice cream. We use many of your recipes and find your website a reliable source for our dietary challenges and the food we make is always so tasty. This was absolutely amazing. My non-vegan husband and kiddos loved it! We all couldn’t believe that it was so creamy. I am so thankful for your creative and yummy recipes! Yay! Glad to hear it, Brittany! I haven’t been able to find lactose free soy free (allergies) cocoa powder in my grocery store so I will probably order online. Have you tried this without and dubbed peanut butter or coconut flakes? Had this for dessert last night with walnuts on top. Substituted hazelnut butter for tahini. I forgot to add maple syrup, ha ha, but it was delicious, and I did not need the extra sweetness! My picky kids said it smelled good, and one of them even tasted it and proclaimed it was yummy. Rare occasion. Thank you very much for this recipe, will definitely make again. Best post flight treat! Don’t know what came over me but I was craving homemade vegan banana chocolate ice cream when I landed. Something quick healthy and good. Maybe it was the magnesium that my body needed. Dropped my bags and made this in 5 min! Thank you Minimalist Baker for the best easiest soft serve ice cream recipe. Hit the spot! Tweaked the recipe just a little bit. Used almond butter instead of tahini and added a small handful of fresh mint in the mix. Used a food processor but still needed to add a little bit of almond milk to get it to blend. Very smooth and tasty. Better than any store bought vegan ice cream. Can’t wait to see what I crave after my next travel. Any other flavors to use with tahini? Would milk taste good instead of chocolate ? If we were to make it vanilla flavored. Also I would like to see another recipe with another fruit With tahini. My idea is to use this as a cake frosting, or a wholefood mousse – would the mixture be ok eaten/stored from the fridge or room temperature? I was thinking to add vegan salted caramel protein powder for extra thickness?? Has this been done by anyone? ? I don’t think it’s a good idea because your basic ingredient is fruit. And it can easily go bad at room temperature. The consistency of this is amazing!!! I can’t wait to make it with peanut butter. I added bourbon vanilla to the original recipe and it was sooo good. Such a healthy fix to my past ice cream addiction. I had no tahini, so I replaced it with hazelnut puree. Absolutely delicious. Thank you for this dessert recipe that has become one of my favorites! How do I avoid the unpleasant icy shell whenever I take out leftover soft serve? It most likely has to do with the freeze and thaw cycle of removing this DELICIOUS-looking treat out of the freezer routinely, but I’m not entirely sure! Anyhow, I don’t think freezing would be too much of an issue, because I could eat the entire yield of this soft serve in a single heartbeat! Oh my days! This was an absolute amazing little dessert fix!! Loved it!! I would like to make this ahead for company. Have you tried freezing it? Any suggestions? Thank you! Hi Malina! Yes! You can keep it in the freezer up to 1 week. Let come back to soft serve consistency at room temperature before enjoying. Hope this helps! Thank you so very much for the wonderful recipes you share and also for answering my question. I wonder how this would be served frozen in an ice pop mold. Ever try it? Do you recommend it? Otherwise I will just take your advice to put it in a container to be left out to get to room temp again. I think that might work if you’re going for more of a frozen-pop dessert, but haven’t tried it! If you do, report back on how it goes! I have been a reader of your website for some time but mostly a silent reader – I do want to let you know that I made the banana soft serve (used almond butter instead because my friend is allergic to seeds) and it came out SO well! Since then I have made different modifications for a little variety and every time it comes out so well. You can’t even make out that it was made with bananas – thank you for this great recipe, I look forward to trying more from your website! Not only is it delicious, but it’s also very healthy. Tahini has a lot of calcium. This tastes amazing! Absolutely love it. When I opened my freezer to make this there was only half a frozen banana! what to do? Add frozen cherries! seriously AMAZING!. thank you! Omg, this was fantastic! Was slightly impatient and bananas were only slightly frozen. After mixing I put it in a baking dish and spread it out to freeze quickly. After frozen, drizzled with your magic shell and tahini. We loved it! I also love this combo (and your site). Another idea- skip the cocoa powder and instead use a little tumeric and ginger for a golden milk-type flavor. But you must top with a few cacao nibs ? I made this and it was delicious. It truly does only make enough for 2 people and once it was gone, I wish I had made more. very creamy and satisfied my chocolate ice cream craving. Made this the night the recipe popped up in my email. It was so yummy. I subbed PB for Tahini. Next time I would probably only do half the PB but it was heavenly! This is awesome. I love it very unique taste with the tahini. A perfect go to as summer arrives. PS I added a splash of almond milk to get my bananas to blend better for those who were having trouble. I just want you to know I think you are a genius. My partner went vegan and I LOVE to cook so I keep looking for tasty vegan recipes. Every single one of yours that I have made have been easy and delicious, and it didn’t matter that they were vegan or not, they were just GOOD. Thank you! I made this “nice” cream last night and it hit the spot. I’m definitely going to have to try this! Never thought of using tahini! So yummy!!! I ended up stirring in more tahini (a few more tbsp) and it came out wonderfully! Thanks for your creativity! 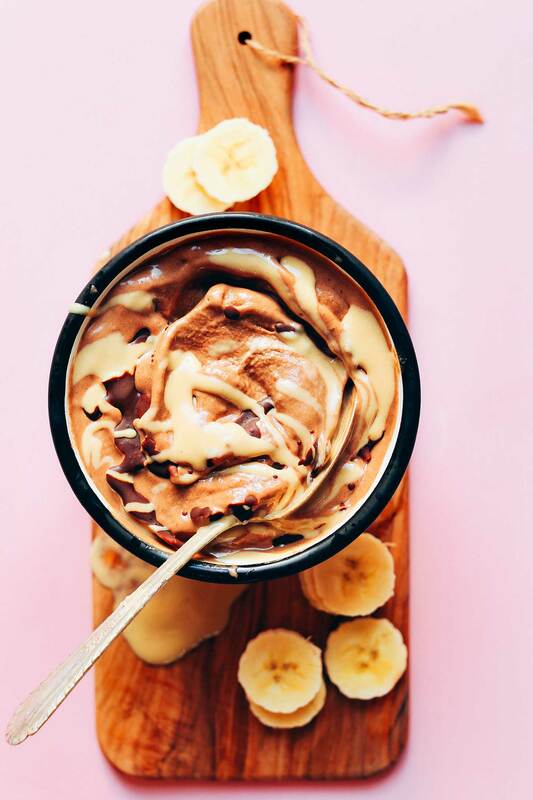 I made the banana ice cream years back & added peanut butter – but chocolate & Tahini are other great ideas!! And the magic shell recipe – you have hit it out of the park on that one! Great ideas!! I see this in my immediate future! Hi, about how many bananas do you think it would take to yield 2 cups? Hi Kristen! About 6 bananas, mashed! I’ve made banana soft serve “nice cream” so many times and just love it. I’ve never tried tahini in it – sounds delicious! I bet that’s delicious! Thank you for this recipe Dana! I have tried a lot of banana icecream flavour combinations but this has to be my favourite! I served it with the magic shell and coconut flakes – so yum!!! This is awesome! Only adjustment we made was adding a tiny bit of maple syrup (about 1 TBSP). Now we will never be able to throw away bananas in our house… straight to the freezer! Thanks for all you do! This was so tasty!! I used almond butter and tahini and I was super impressed with out delicious it came out! Tahini’s taste alone is not yummy to me, so I’m not sure I’ll like this. Well,you never know until you try! I’m the same way and it tasted a bit too bitter for me. next time I’ll make this with peanut butter or almond butter. the magic shell was amazing. Takes hummus, dressings-etc to the next level! I tried Soom brand! I did a side by side taste test and do think Soom is superior. However I haven’t yet decided to make it my default tahini for everyday eating. For a special recipe I might order it again. You’re my food spirit animal. ?BEST FOOD BLOGGER ALIVE ? I am consistently wowed by your talent. I make your recipes and have never been disappointed. Thank you so much for making my vegan lifestyle fun and flavorful. You need a TV show. I can’t wait to try this recipe, and your Tahini Bombs! There could not be a more true comment! She is also MY food spirit animal! When do we get t-shirts made?! I’m with you guys. Dana makes eating vegan so exciting. Thanks for sharing your talent. This soft serve was, as expected, awesome!!!! Yes!!!! You took the words right out of my….. keyboard ;). This is just what I’ve been missing. This looks delicious, I am in a tahini obsession at the moment so this is going straight to the top of my recipe to do list. Thank you for sharing! Hi I have made banana soft scoops icecream but my blender struggled with the frozen bananas. Could I blend them unfrozen then use my icecream maker? Try a food processor, I use a mini one that attaches to a stick blender and it’s much better for ‘ice cream’ than using my vitamix which is def better for sauces and smoothies. My vitamix also doesn’t deal with frozen bananas well. My banana nice creams normally turn into puddings (I think the blender defrosts my bananas for some reason). Thanks for the advice, I’ll try a food processor next time.